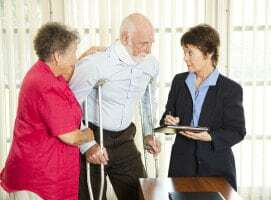 Although considerably easier for people over the age of 50 to be approved for Social Security Disability (SSD) benefits from the Social Security Administration (SSA), those who work with an experienced Los Angeles elderly disability attorney is more likely to secure more of the benefits that they are entitled to. This is because a Los Angeles Elderly Disability Attorney will me experienced and qualified to handle such a case. The SSA realizes that it is more difficult for people over the age of 50 to return to full-time work after an injury. Not only can full-time work be more demanding on a person’s body over the age of 50, it is also more difficult for people over age 50 to find full-time employment in their fields – particularly if they were employed in physically demanding trades. If they are between the age of 50 and 54, they may qualify for SSD benefits if they are told by a doctor that they are limited to sedentary work, which is generally considered work that can be completed while sitting down and that requires lifting no more than 10 pounds. For those age 55+, the standards become even more relaxed, and it is easier to be awarded benefits. To know more about how SSD laws work in your area, you can get help from a Disability lawyer in Los Angeles CA. For those aged 55+, seeking help from an experienced Elder abuse lawyer in Los Angeles California would be even better. The Los Angeles Elder law attorneys at The Law Offices of Tony Adderley are highly experienced in this area of law. Tony Adderley and his dedicated legal staff are experienced professionals in the field of social security benefits law that have been helping elderly Americans get the benefits they deserve for several years. With him by their side, elderly SSD applicants can be sure that they will have the highest chance of being awarded all of the benefits they are entitled to. Attorney Tony Adderley has been practicing as a Los Angeles Elderly Disability Attorney for many years now. The SSA is well known for denying benefits applications from individuals who actually qualify. This is usually due to an improperly or inadequately filled out application. Los Angeles elderly disability attorney Tony Adderley can help his clients, even if they have been denied for SSD benefits already, through every step of the application process and, if necessary, the appeal process. He has been serving as a Disability lawyer not only in Los Angeles California, but he also provides services in San Bernardino and Riverside, CA. Call our office to speak with our Los Angeles Elderly Disability Attorney right away.